"Why Aren't These Headlines Department?" Find a link that doesn't work? Copy/Paste it to the Way Back Machine. Nicholas D. Kristof's series from the streets of Iraq. Democracy Is Dead: Requiescat in Pace, R.I.P. Bush Affair Gone Awry: Lieberman "Surprised And Disappointed"
Hmmmm......Jeb Declared Martial Law In FL On 9-7. Oh, It's just a "co-inky-dink"
We DID threaten the Taliban! Did Bush/Cheney Shoot Down Flight #93? From the "It's about Oil, Stupid" Dept. "Bush isn't thinking ahead" - Oh...ya THINK? 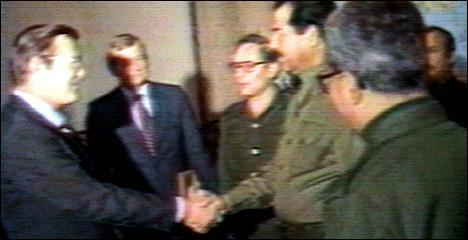 How Do We Know Saddam Has Dangerous Weapons? Because Reagan, Bush Sr. and Rummy Sold Them To Him! Bush agrees to Independent Investigation into 9/11. Stephen Push with Families of Sept. 11 says, "It's a fraud." "An open letter to America" - You really need to pass this along. Excuse Me?? Bush threatens to use troops against West Coast dockworkers!! W. FORGETS THE NUCLEAR THREAT. Why would Osama bin Laden want to kill Dubya, his former business partner? Ya just Gotta LOVE Helen Thomas! "Bush acting as imperial president"
"Carlyle's Way" or "How to Make a Buck off your Son's "War"
Europe tells Shrubby, "Don't wag your finger at us, Mr Bush"
Wrongly listing citizens as felons likely cost Gore election. From Buzzflash - Katherine Harris Says She Upheld The Rule of Law in 2000 -- NOT!